KAMPALA, Uganda, June 27, 2018 /PRNewswire/ — The Government of Uganda today released its strategy to deliver on commitments under the Paris Agreement, in a blueprint known as the Uganda NDC Partnership Plan. Building off progress already made through Uganda’s existing climate plans and policies, the country’s Nationally Determined Contribution (NDC) under the Paris Agreement captures the country’s ambitions for a sustainable future. The Partnership Plan complements this vision, while also serving as an accelerator for action. The Plan identifies five priority areas set by the government for implementation of its NDC, and begins to connect those priorities to available partner and program resources from across the NDC Partnership and its network. The newly-approved NDC Partnership Plan serves as the basis for planning, coordination, resource mobilization and transparency on NDC implementation between the government and partners to work together to help Uganda achieve its climate and development goals. 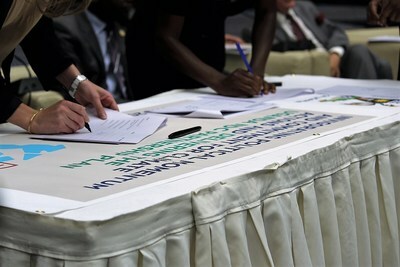 To date, a number of implementing partners, both from inside and outside the NDC Partnership, have already pledged support to Uganda, including the Governments of Sweden, the Netherlands, Germany, France and Austria; the European Union; United Nations Climate Change (UNFCCC); United Nations Development Program (UNDP); the African Development Bank; the World Bank; the Food and Agriculture Organization of the UN (FAO); the Global Green Growth Institute (GGGI); Environmental Management for Livelihood Improvement Bwaise Facility (EMLI); Conservation International; International Union for Conservation of Nature (IUCN); National Adaptation Plan – Global Network (NAP-GN); and World Resources Institute. The NDC Partnership is a global coalition of countries and institutions committed to advancing ambitious climate and development action, co-chaired by the Kingdom of Morocco and the Federal Republic of Germany, which was represented at the launch event by German Ambassador to Uganda Dr. Albrecht Conze. The Partnership has grown to include 74 member countries, 17 institutional members and four associate members since its launch at COP22 in Marrakesh in November 2016. Of these members, Uganda was one of the first countries in Africa to join the NDC Partnership, and formalized its request for technical assistance in September 2017. The NDC Partnership is supporting more than 30 developing countries to enhance and implement their NDCs through technical assistance; capacity building; knowledge sharing and facilitating access to finance. Members give specific support to strengthen policy frameworks; mainstream climate actions into national, sectoral and sub-national plans; develop budgeting and investment plans; share knowledge and resources and build more robust monitoring and reporting systems in line with country-driven requests. For more information on the NDC Partnership, visit ndcpartnership.org.